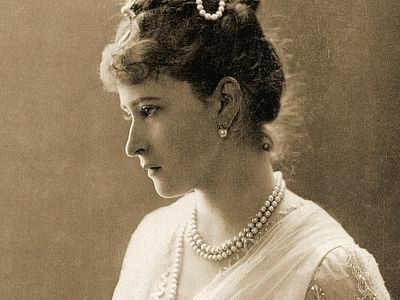 This year’s Royal Days celebrations in the Urals were especially important and festive, with the 100th anniversary of the execution of the holy Royal Martyrs being celebrated on July 17, and the execution of St. Elizabeth the Grand Duchess and sister of Tsarina Alexandra, the Nun Barbara, and Grand Duke Sergei Mikhailovich Romanov, the Princes Ioann Konstantinovich, Konstantin Konstantinovich, Igor Konstantinovich, and Vladimir Pavlovich Paley, and Grand Duke Sergei's secretary Fyodor Remez being celebrated on July 18. The annual Royal Days international festival of Orthodox culture is dedicated to the anniversary of the death of the family of the last Russian Tsar Nicholas II. The festival ran from July 12 to 21 this year, and was headed by His Holiness Patriarch Kirill. The main celebration was the nighttime Liturgy and cross procession in honor of the Royal Martyrs, in which 100,000 faithful from around the world participated. Another highlight of the festive days was the veneration of the relics of St. Elizabeth the Grand Duchess and New Martyr in Ekaterinburg and Alapaevsk. About 60,000 faithful came out to show their love and veneration for the holy martyr, reports the Diocese of Ekaterinburg. The Grand Duchess’ relics were kept in the Church on the Blood July 13-15 and 18-21, and in Alapaevsk, where she was martyred, July 15-18. A 23-ft. monument to St. Elizabeth was opened in Alapaevsk last year. The 100th anniversary of the martyrdom of Sts. Elizabeth and Barbara and those with them was also festively celebrated by a number of hierarchs, clergy, and faithful, at the place of her martyrdom. Following the service, the hierarchs, clergy, and faithful processed to the mine where the bodies of the holy martyrs were thrown on the night of July 17-18, 1918. A moleben was celebrated at the mine, followed by the singing of the Cherubic Hymn, which the martyrs sang throughout the course of several days within the mine until they finally departed to the Heavenly Kingdom. The relics were returned following the All-Night Vigil in Ekaterinburg’s Church on the Blood on July 21, to the Martha and Mary Convent in Moscow, founded by St. Elizabeth, where the piece of her relics is kept. 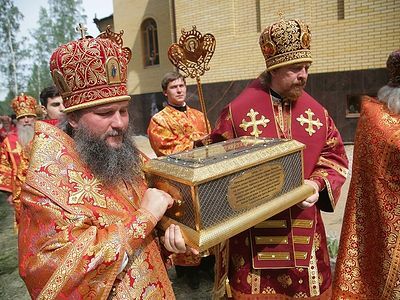 The reliquary had been taken to the Urals for veneration by Pat. Kirill. The memory of Sts. 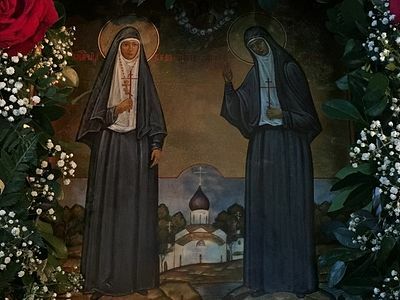 Elizabeth and Barbara and those martyred with them were also festively celebrated at the Russian Orthodox Church Outside of Russia’s St. Mary Magdalene Monastery in Gethsemane, where the holy martyrs’ relics repose.